The Gampaha District is a mixed urban and agricultural district located on the Western coast of Sri Lanka just north of Colombo in the Attanagalu Oya River basin. It’s an important, rapidly developing suburb of Colombo that is unfortunately very prone to flooding. Increased urbanization has created increased exposure to human, material, and financial damages from flooding even as increased climate variability from climate change has increased the incidence of major flood events. The OpenDRI team is helping the Sri Lankan Disaster Management Centre plan for and respond to these floods by mapping the flooding exposure of all the roads, buildings, agricultural lands, and other key infrastructure in OpenStreetMap, an open data platform where data can be easily shared. This data will be collected from satellite images by the OpenDRI team and then verified and attributed with indicators of exposure (building materials, foundation height, etc.) 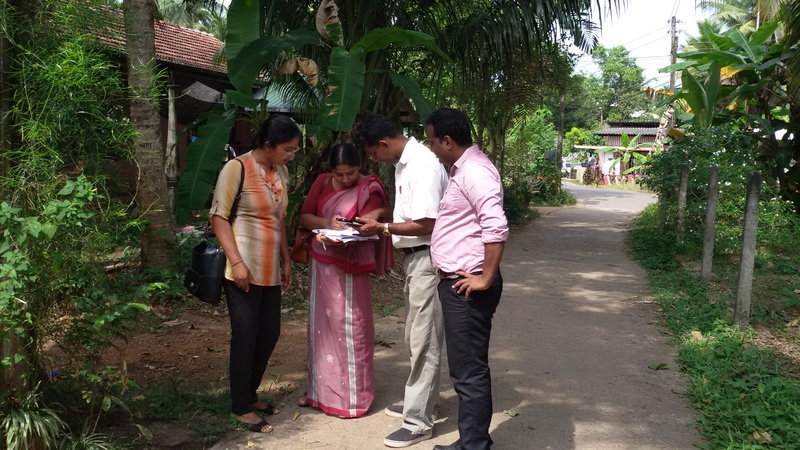 during field visits by local government officers representing villages or neighborhoods (known in Sri Lanka as a Grama Niladhari or GN). This effort by the Open Cities project will help local disaster managers better prepare and plan for floods. The data will also be used to develop flood basin investment plans through the climate resilience improvement project of the World Bank. Presently the project team has completed (satellite-based) building footprint mapping for 101 GN Divisions in Gampaha district secretariat (DS). Next the team will focus on conducting field surveys with local government officers in the Gampaha DS, before repeating the exercise for 86 GNs in Ja-Ela, Katana and Minuwangoda DS. In total the project will map exposure in 187 GNs covering almost 200 square kilometers. That’s over 150,000 buildings and a huge amount of roads, agricultural land and key infrastructure.